Considering it costs well under two grand, the 65X850E manages to cling on to a startling amount of relatively high-end features - including, most notably, Sony’s excellent X1 picture processing system. This joins a much-improved backlight system in making the X850E Series not just much better than its 2016 predecessor, but one of 2017’s biggest bargains to date. Sony’s 2016 flagship televisions, the Sony 65ZD9 and X930D, were two highly regarded big screens last year and were among our favorite TVs in the company’s AV arsenal. And though they were fantastic to stare at, the problem with Sony’s flagships were their exorbitant price tags. Sony is still offering pricey screens this year in the form of the A1E OLED and X930E, however it’s also offering great budget sets like the X850E series as well. So how does Sony’s budget series stack up to its more expensive competition? Surprisingly well, actually. The XBR-65X850E cuts a pretty pleasant dash in your living room. Its bezel is trim, its desktop stand is mounted in the centre for easy seating on even narrow bits of furniture, and the stand’s open frame design gives it a ‘barely there’ look that leaves you free to focus on the on-screen action. The black frame features an attractive sliver of silver running through its centre too, and the chassis is pretty slim round the back for such an affordable model - especially over its top six inches or so. Connections are pleasingly numerous for such an affordable TV, with highlights of four HDMIs, three USBs, and both Wi-Fi and wired network options. It’s great, too, to find Sony providing a highly effective cable management system built into the desktop stand. The only problem with the design is that it’s a bit flimsy. The TV’s bodywork turns out to be much more lightweight and plasticky than it looks, while the stand flexes quite alarmingly until the TV has been fully attached to it. I should stress, though, that the TV isn’t wobbly or unstable once it’s all put together. Also, the flimsy build isn’t really noticeable from a typical viewing distance. Design TL;DR: The X850E series is attractive, trim, and distinctively Sony, but you can’t help notice when you’re putting it together that its build quality is nothing to write home about. The X850E series uses Google’s Android TV service, which continues to strike us as pretty much completely the wrong approach to smart TV design. Its full-screen home screen is cluttered and messy, and shows little or no evidence that it understands where TV user (as opposed to smartphone user) priorities lie. You can’t customize it much either, and its recommendations system is about as intelligent as a brick. It’s also prone to crashing and runs sluggishly - as well as seeming to slow the TV’s general operation menus down. That being said, Sony has additionally made sure that the X850E’s Netflix and Amazon Video apps both support 4K and HDR – perfect for demonstrating the performance of the set. Smart TV TL;DR: While Android TV certainly isn’t short on apps, it’s questionable how many of them are of much use to TV users. The 65X850E’s shift to a contrast-rich VA panel from the low-contrast IPS panels used in last year’s X85 models combines with Sony’s X1 video processing to deliver an excellent HD and standard dynamic range performance. The X1’s upscaling engine for remapping HD images to the screen’s 4K resolution works ridiculously well for such an affordable TV. It adds plenty of sharpness without making the image become gritty or causing thin lines and edges to look stressy, and it also does an uncanny job of calculating the best color tones for each of the millions of extra pixels it’s creating. There’s no sense of smearing over motion with the upscaled pictures either. In fact, they don’t look processed at all. It’s worth pointing out that step-up Sony TVs that use the X1 Extreme processing chipset deliver even more insight and purity in their upscaled HD images. Compared more fairly with other TVs in its price point, though, the X850E’s upscaling efforts are exemplary. Considering that the screen copes (as we’ll see) pretty well with high dynamic range sources, it’s no surprise to find it doing brilliantly with the relatively narrow demands of standard dynamic range images. Dark scenes reveal deeper blacks than we’d expect to find for $1,599, as well as impressively little distraction from backlight clouding or striping issues. Colors with SDR content look both punchy and natural - not least because the presence of Sony’s Triluminos processing helps the screen serve up a fantastically nuanced range of tones that gives you a new appreciation for what SDR is capable of. HD/SDR TL;DR: Thanks in no small part to its X1 processing system, the 65X850E is an outstanding performer with the HD/SDR content that will still occupy the majority of your viewing time. The 65X850E does a genuinely spectacular job of maximizing the impact of its native 4K/UHD resolution. Thanks again in no small to measure to the many different areas of expertise covered by the X1 chipset, no pixel in a good quality 4K source feels like it’s being wasted or ‘lost’ behind such common affordable LCD issues as softness, noise or poor color resolution. That all-important ‘window on the world’ effect we look for with 4K screens is delivered on in spades. Even more impressively for the 65X850E’s $1,599 price point, the native 4K crispness hardly reduces at all when there’s a lot of motion in the frame. Sony’s Motionflow processing isn’t quite as accomplished in the X1 version here as the X1 Extreme version that kicks in with Sony TVs from the X930E on up, but you can still use it on its Standard setting to reduce judder without it creating many unwanted side effects. Should you be a devout motion processing hater, though, fear not; the X850E Series still looks more natural and clean with motion than most rivals even with Motionflow turned off. Sadly, the situation is a bit more complex when it comes to the 65X850E’s handling of high dynamic range images from Ultra HD Blu-rays, Netflix and Amazon (plus one or two other streaming services if you’re in the US). Looking at the bad news first, the 65X850E isn’t very bright by HDR TV standards. We measured just under 450 nits of light output from the screen when feeding it a 10% white HDR window. That’s barely a third as bright as Sony’s own X930E TVs, and only just over half as bright as Sony’s A1 OLED TVs. While this is probably to be expected at the 65X850E’s price point, such a brightness level can’t deliver that ‘real world’ intensity of light that HDR was really created to reproduce (see Planet Earth II in particular). Most HDR content, after all, is mastered to a peak brightness level of 1000 nits or 4000 nits. The 65X850E’s brightness limitation also prevents it from delivering HDR’s lovely peak light highlights and extra shadow detail refinements in dark areas. The X850E additionally doesn’t have enough brightness to give the sort of color volumes (the term used to describe the impact of different levels of light on color tones) we’re increasingly starting to look for with HDR TVs. And there’s no doubt at all that the 65X850E’s relatively low brightness can make watching HDR - or, at least, dark HDR scenes - in a bright room problematic. Despite all this, the 65X850E is certainly not an HDR disaster. Its HDR brightness levels are still roughly double those of its SDR ones, so you certainly get a genuine sense of extra impact from HDR sources. The X850E maximizes the impact of its available brightness, too, by providing really impressive black levels for such an affordable TV. There’s less general greyness over parts of the picture that should look black than we had expected, plus, even better, there’s seldom any significant backlight clouding over dark areas - even when a bright object appears against a dark backdrop. The 65X850E also delivers more than a sense of the wide color ranges associated with the vast majority of HDR content. This is thanks in no small measure to the prowess of Sony’s Triluminos processing technology, which here manages to achieve tonal saturations, intensities but also, crucially, subtleties that elude most similarly priced rivals. Including some sets that on paper at least appear to be brighter. One last performance element to cover is its input lag, i.e. the amount of time a screen takes to render its images is of critical importance to gamers, so it’s great to find Sony’s set only suffering just over 20ms of lag on average. It’s worth pointing out that this mean figure is averaged from fluctuating measurements that go as low as 10ms but also (rarely) as high as 50ms. UHD/HDR Performance TL;DR: The 65X850E showcases every pixel of a good native 4K image beautifully - even during action scenes. A lack of brightness limits its HDR abilities, but excellent color and light management ensures that HDR pictures often look better than those of some, if not many, brighter rivals. With its plasticky build and slender design it’s hardly surprising that the X850E Series is hardly a stand-out audio performer. Its speakers come up way short of the sort of bass depth good film soundtracks like to deliver, leaving action sequences sounding thin and trebles tending to hit the ear rather harshly. Before you all start adding the cost of a soundbar to the 65X850E’s aggressive price, though, it’s far from an audio disaster. It’s capable of plenty of volume without the speakers breaking down into distortions or crackles, it handles day to day non-movie audio tracks cleanly and crisply, and it manages to create a wide, deep and immersive sound stage despite the minimal bass. Sound performance TL;DR: Bass is thin during action movies, but otherwise the 65X850E sounds better than expected. In terms of 2017 TVs, Samsung is likely to be Sony’s biggest rival in the mid-range 4K HDR space, particularly with the 55-inch UN55MU7000 – a review we hope to have for you sooner rather than later. Regarding rival sets we have already tested, your best bet is to look at star 2016 TVs currently enjoying serious price cuts. The LG OLED55B6 and OLED55C6 are outstanding performers - at least for dark room movie viewing - currently retailing for under $1,200 on some online sites. 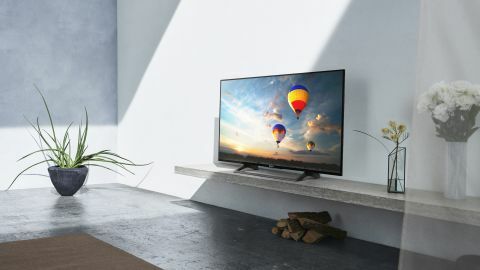 By introducing its exceptional video processing further down its TV range than ever before and being brave enough to dial down the brightness a bit to deliver a more even, immersive backlight experience, Sony's struck mid-range gold with the X850E Series. Sure, in an ideal world we’d get a bit more brightness to go with its impressive, even black level response. And we’d also get a more efficient, effective smart TV engine than Android TV. Ideal worlds, though, are hard to come by. The simple fact is that few TVs we’ve seen in recent times have balanced price, contrast, brightness and color quite so all-round effectively as the 65X850E.